After much speculation and anticipation over the past couple of years, Rappcats now has a 7.5″ all-vinyl J Dilla figure available for purchase. The tribute to the late, great producer was put together by a gang of folks. The initial design was conceived and drawn by Detroit artist Sintex. The design and sculpting was handled by Korea-based toy artist P2PL. Then the process saw completion with an added final touch from Stüssy, while Dilla’s Pay Jay handled the production of the figures. 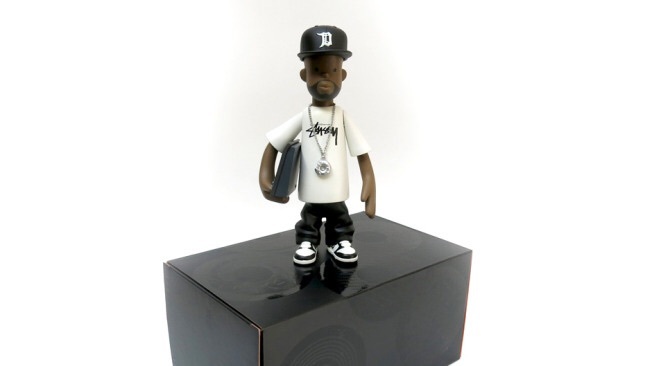 The vinyl figurine comes dipped head to toe in all things Dilla including a removable Detroit MLB fitted, an officially licensed Stüssy tee, MPC tucked under the arm, a donut chain, and even Dilla’s trademark beard. The J Dilla figure is available to pre-order for $60 from the good folks over at Rappcats, but hurry up because these joints are limited to 2,000 pieces.